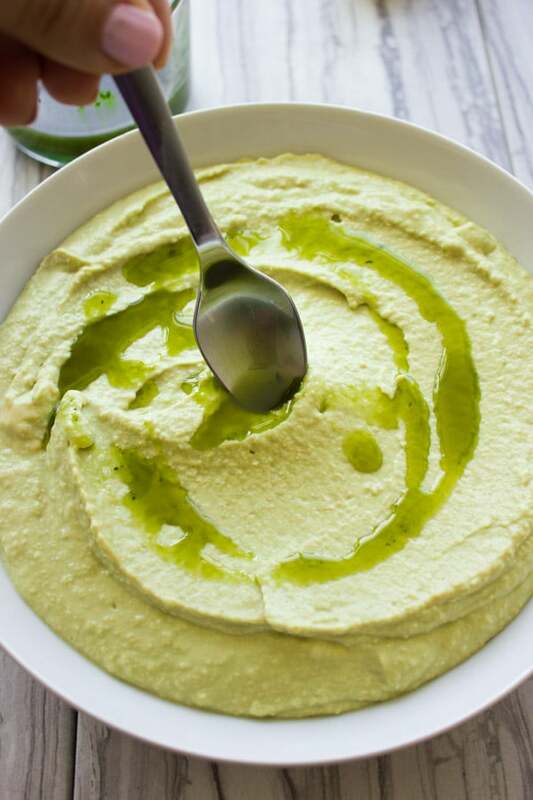 This Matcha Power Hummus recipe is the ABSOLUTE ultimate protein and anti-oxidant packed dip! 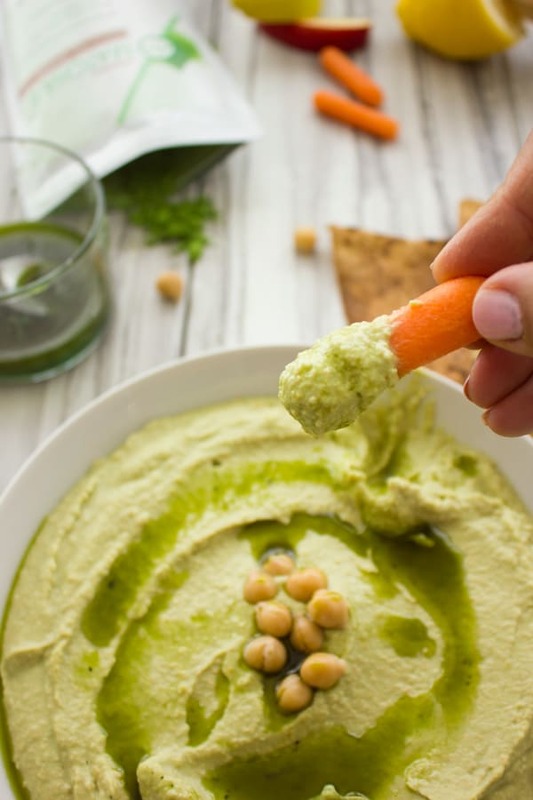 It takes 5 mins to prepare and can be stored in the fridge for days and days—if you can make it last that long 😉 The Matcha adds an unbelievably earthy and a slightly sweet taste to the hummus—making this the BEST hummus EVER! It’s a must try recipe for all you hummus lovers! 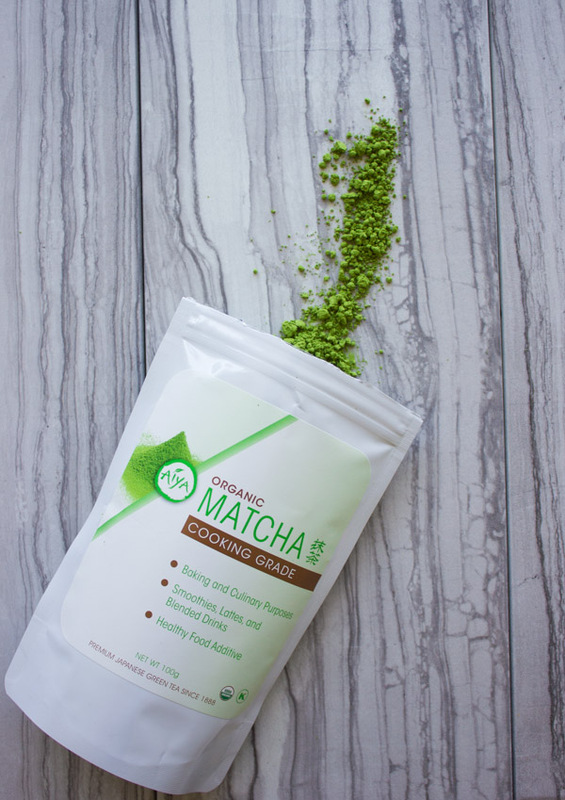 Today’s post is sponsored by the fabulous Aiya Matcha. Aiya is one of the world’s leading supplier of high quality organic Matcha (pure green tea leaf powder) from Japan. Supplying Japan, Europe and America—in fact it is the biggest supplier and manufacturer of Matcha green tea in America. It also happens to be one of the oldest companies est.1888 in Nishio city, Japan. 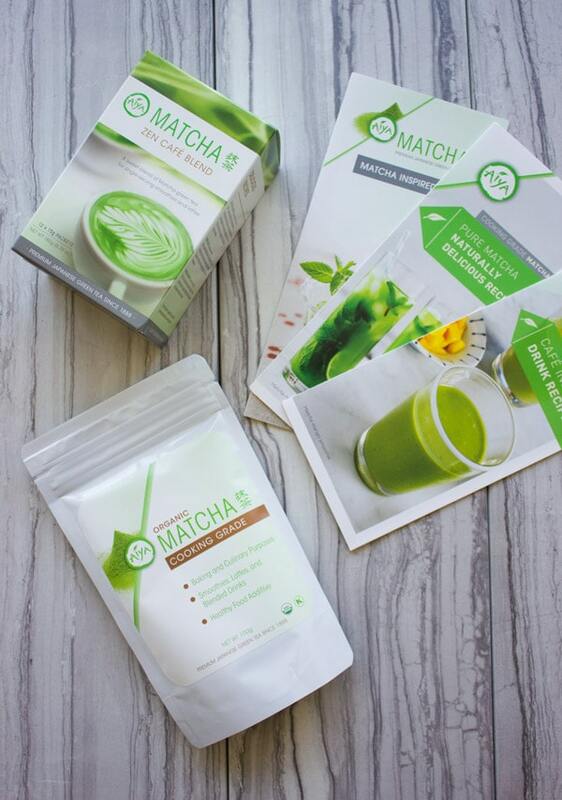 If you visit their website, you’ll find plenty of interesting facts about Matcha green tea, the company Aiya and some fabulous recipes. You’ll also find an online store so you can get yourself some of that pure, high quality organic Matcha yourself! So if you’re new to Matcha green tea, let me tell you—you’ve been missing out! I rarely refer to it as green tea, only because it doesn’t compare to what we know as green tea. Matcha is the pure leaf of tea, grown ONLY in the shades, ALWAYS handpicked, dried and ground by VERY slow and low friction stone mills, then whisked by a bamboo stick. So the result as a vibrant emerald GREEN colored powder, a deep taste of pure green tea leaves with a sweet note, velvety smooth feel and a load of NUTRIENTS! Amino-acids, anti-oxidants and more! So clearly, this is NOT your average green tea. I’ve used Matcha before in this hemp matcha kale power boosting smoothie—if you make this once, it’ll be your official go to green smoothie! Aside from the many fabulous drinks you can use Matcha for, it’s also great used for baking. When using Matcha, only a little bit goes a LONG way. Because of how pure it is, you only need a teaspoon or so to get the best flavor and nutrients! Try loading the Matcha in your cookies, cakes, breads, muffins, brownies (YES even brownies! !—Actually there’s a very famous Japanese treat made with Matcha and chocolate, and this combination of white or dark chocolate and Matcha is absolutely DIVINE!!). 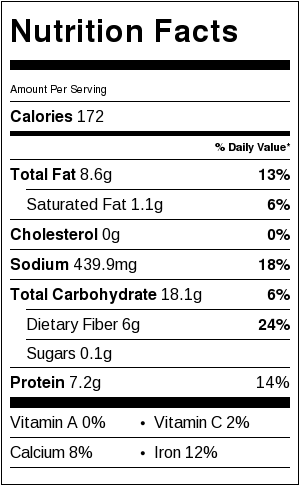 And today we’re loading Matcha into an all time favorite savory snack! 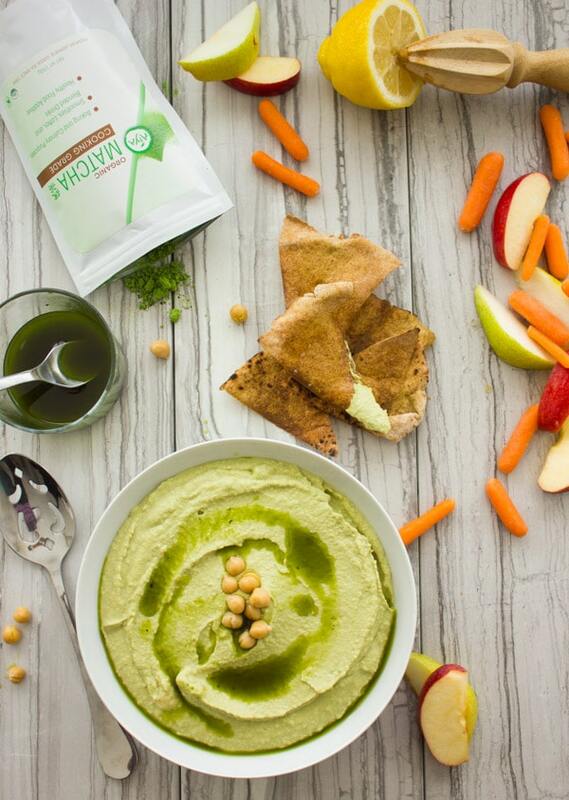 What perfect compliment to the super power Matcha green tea powder other than the protein packed hummus? Together they’re like a power duo. A snack/dip that’s prepared in 5 mins and powers you up all day! And as a bonus, it’s a real crowd pleaser. Take this to a bbq, picnic, potluck and you’ll be the star of the day! Or make a large batch of this Matcha power hummus to keep in the fridge for week lunches and anytime you look for a snack. It’s also a perfectly vegan and gluten-free dip, so it’s a win win! 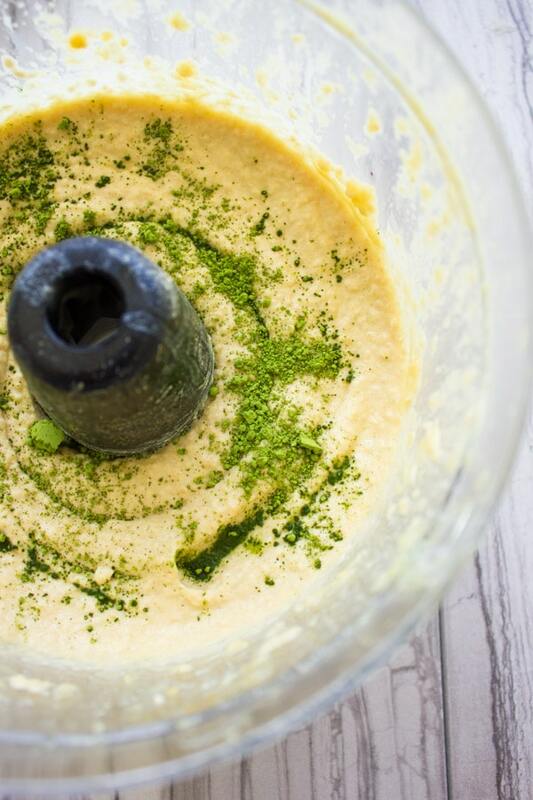 Basically here’s how this lick your fingers delicious Matcha power Hummus comes together—a food processor is the only tool you need. Blend in the chickpeas, water, garlic, lemon juice, salt, tahini and cumin until smooth. Then add in a teaspoon and a half of Matcha powder and blend in. 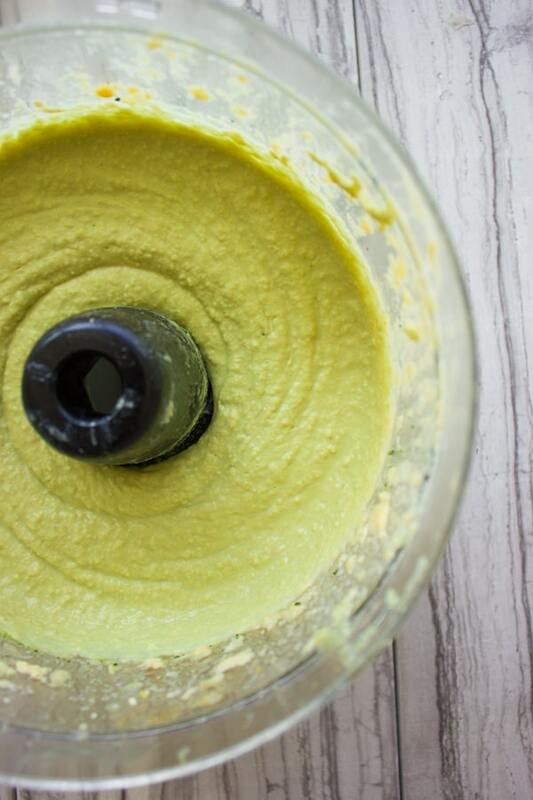 You’re left with velvety smooth utterly flavorful Matcha hummus. Which is exactly all the taste you LOVE in hummus, only slightly sweeter and earthier. To boost up the flavor a bit more (you know me—all about the flavor!! :)) I drizzle this power house Matcha hummus with a Matcha olive oil. This is simply 1/4 cup of olive oil mixed with 1/4 teaspoon of matcha and a pinch of salt. 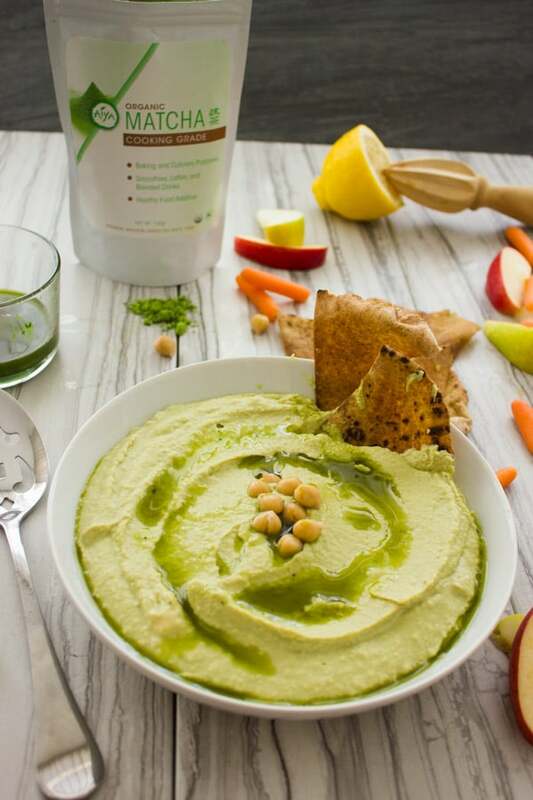 This Matcha olive oil drizzle over the luscious Matcha hummus adds an extra depth of that earthy green tea taste which will make everyone reach to dip for more of it! Plus, I brush it over some pita wedges and toast them in the oven for a Matcha Pita chip too! It’s Matcha power galore here! This is really an absolute NO MISS recipe! One that you will enjoy over and over again. 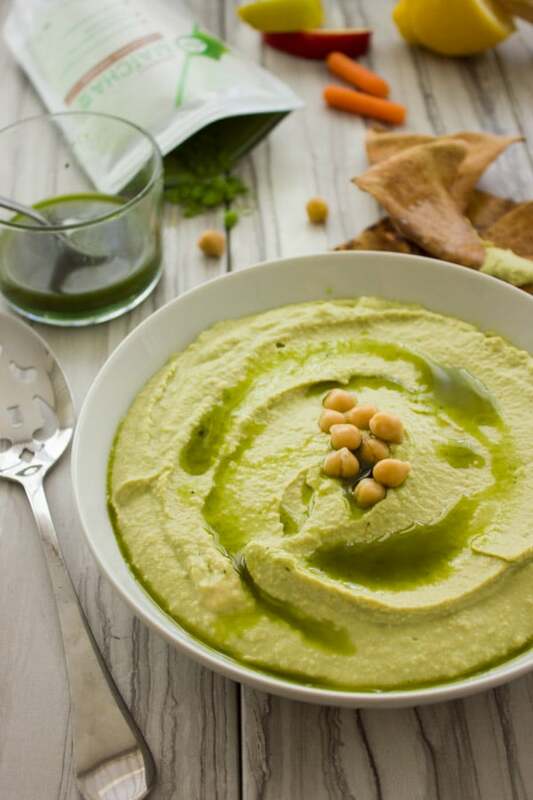 Try sharing it with your friends and watch them all guess what the secret green ingredient in your hummus is! 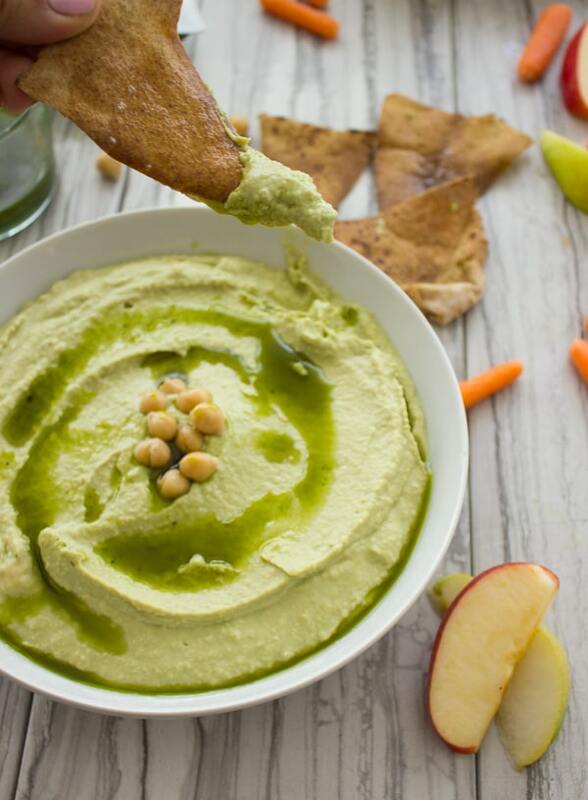 😉 Spare yourself 5 mins and make this YUMMY Matcha hummus recipe today! Apples , carrots and cucumbers. 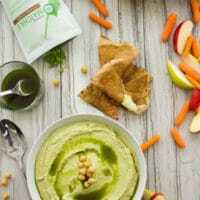 Drizzle with some Matcha olive oil on top and serve with your favorite dippers--I used Matcha pita chips, apples and carrots. For the Matcha Olive Oil: Mix all ingredients in a small bowl. For he Matcha Pita chips: Preheat the oven to 375 degrees. Lay the pita bread wedges in a single layer on a baking sheet and brush them with a thin layer of the matcha olive oil. Disclosure: This is a sponsored post by Aiya Matcha. All opinions expressed in this post and on the blog are my own. Something I would have never thought of doing. Looks fabulous, that colour! OMG! How have I not thought of matcha hummus?! Will definitely be trying this out soon.